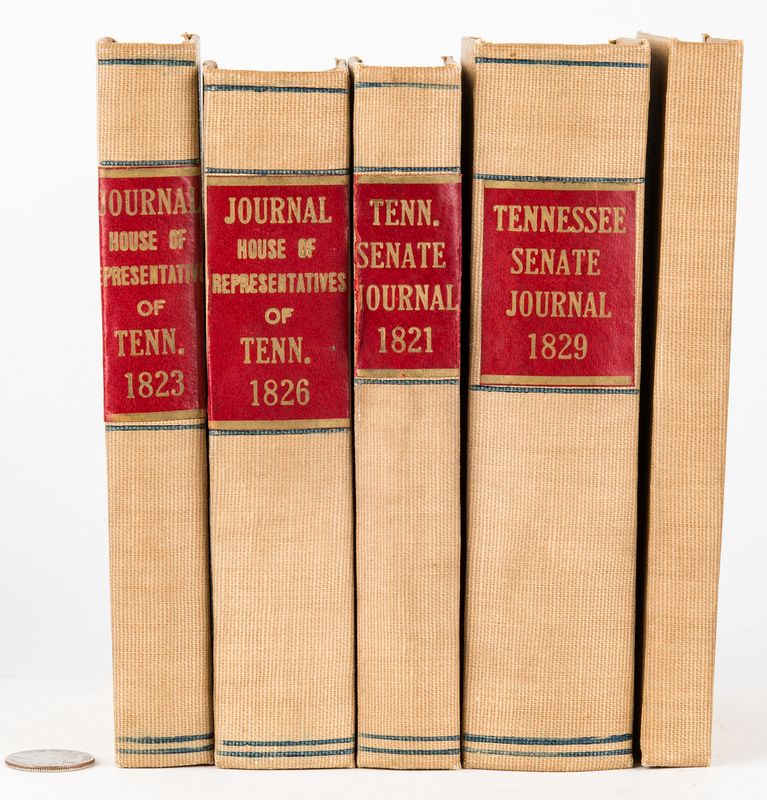 Five (5) Journals of the Tennessee Senate and House of Representatives. 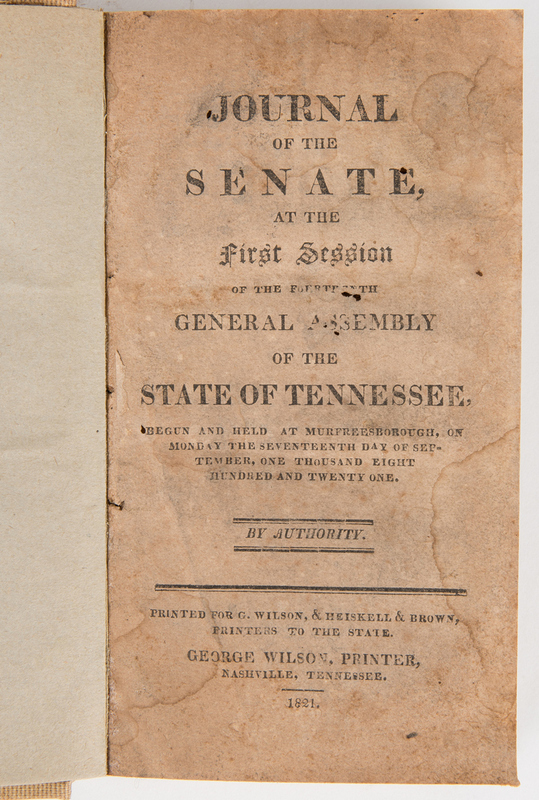 1st item: Journal of the Senate at the First Session of the Fourteenth General Assembly of the State of Tennessee, 1821. 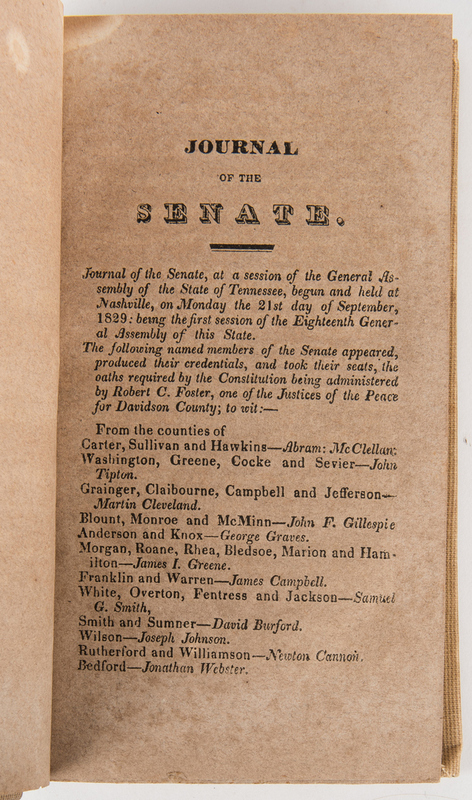 Printed by George Wilson, Nashville. 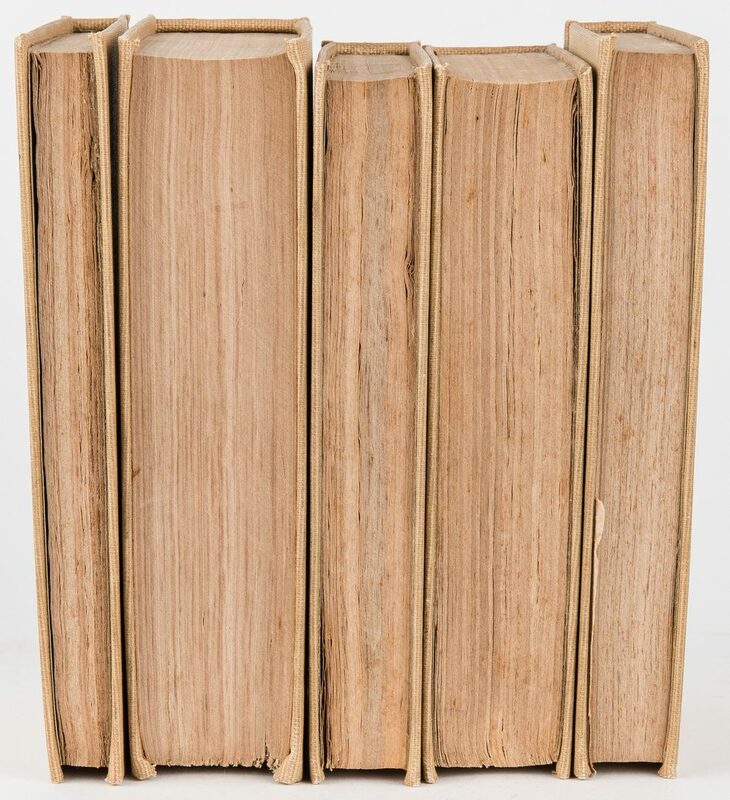 12mo, 344 pages, rebound in tan cloth, red leather label with gilt lettering to spine. 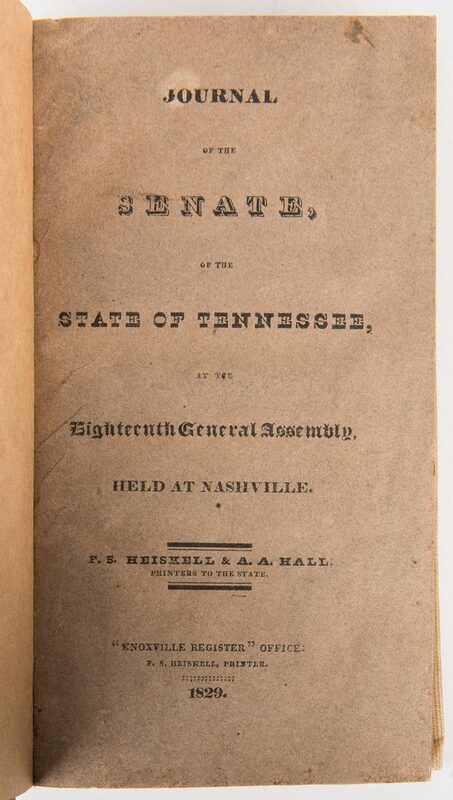 7 3/4" H x 4 1/2" W x 1 1/4" D. 2nd item: Journal of the Senate at the First Session of the Fifteenth General Assembly of the State of Tennessee, 1823. 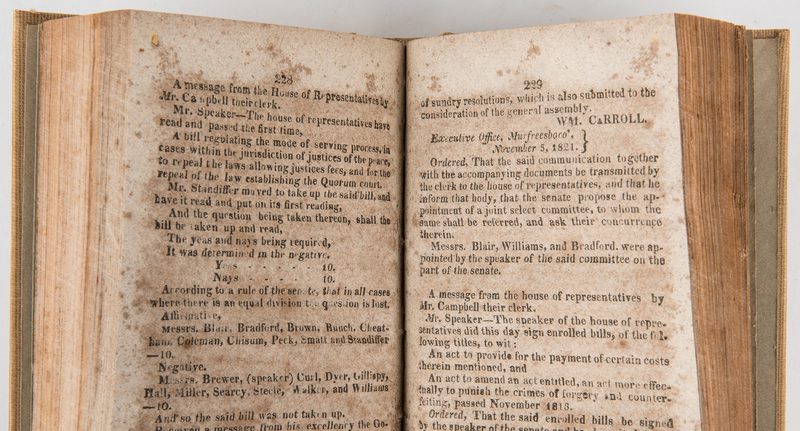 Printed by J. Norvell and G.A. and A.C. Sublett, Murfreesborough [sic]. 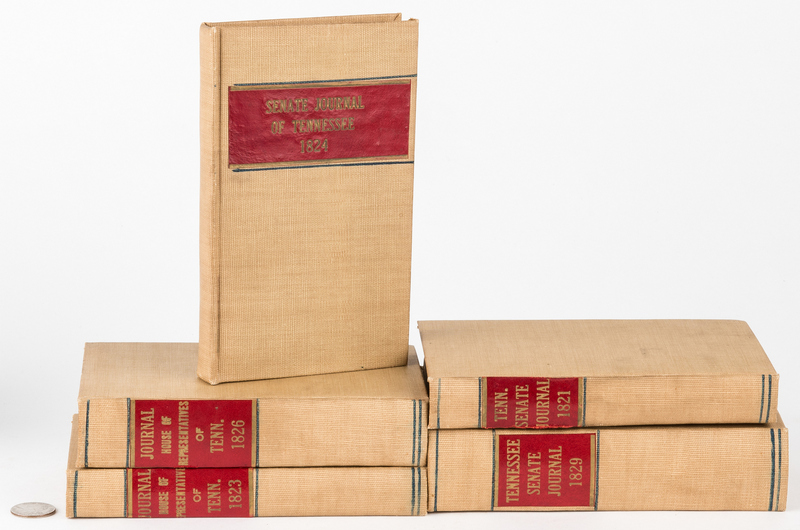 12mo, 348 pages, rebound in tan cloth, red leather label with gilt lettering to spine. 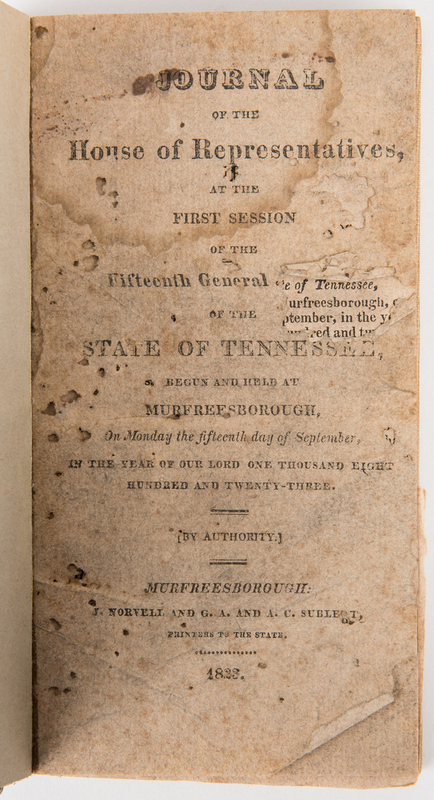 7 3/4" H x 4 1/2" W x 1 1/4" D. 3rd item: Journal of the Senate at the Second Session of the Fifteenth General Assembly of the State of Tennessee, 1824. 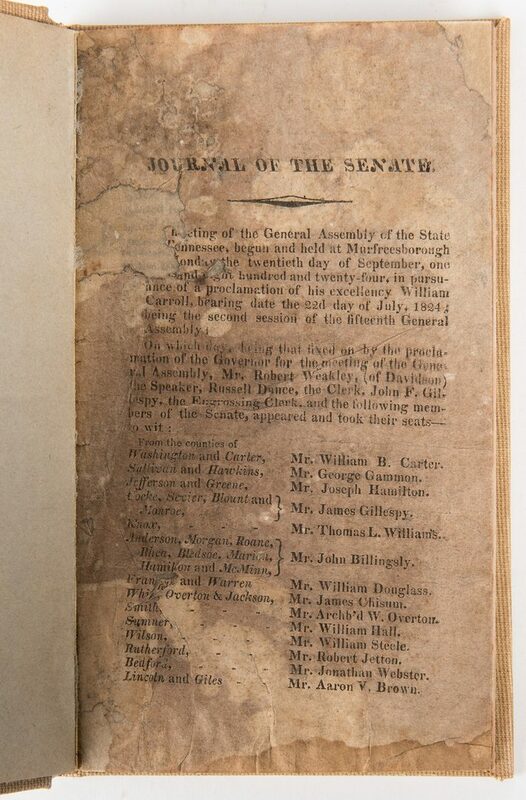 12mo, 200 pages with two page Journal of the Committee of the Whole of Both Houses; on the Resolution for the Call of a Convention, rebound in tan cloth, red leather label with gilt lettering to front cover. 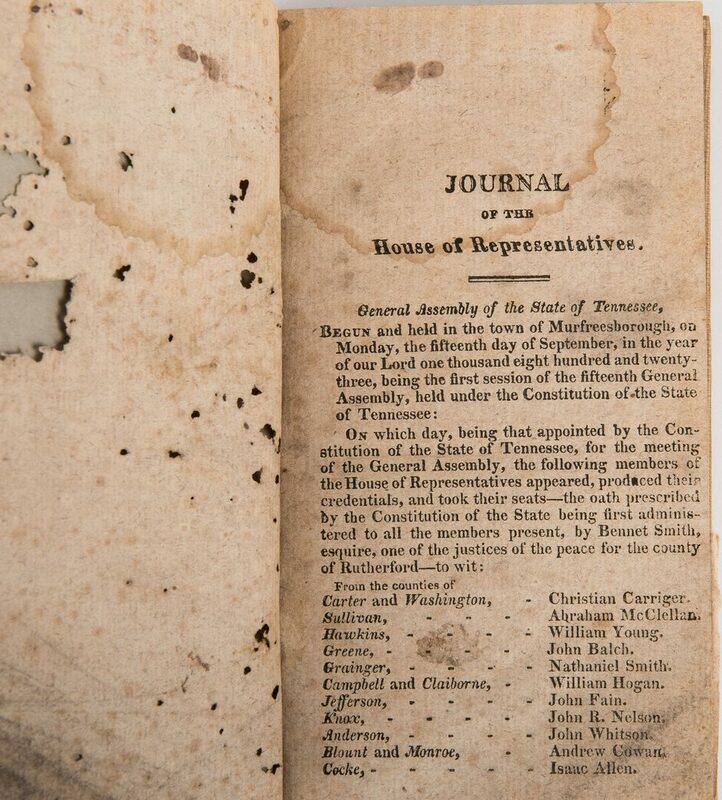 7 3/4" H x 4 1/2" W x 1" D. 4th item: Journal of the House of Representatives at the Called Session of the Sixteenth General Assembly of the State of Tennessee, Begun and Held at Nashville, 1825. 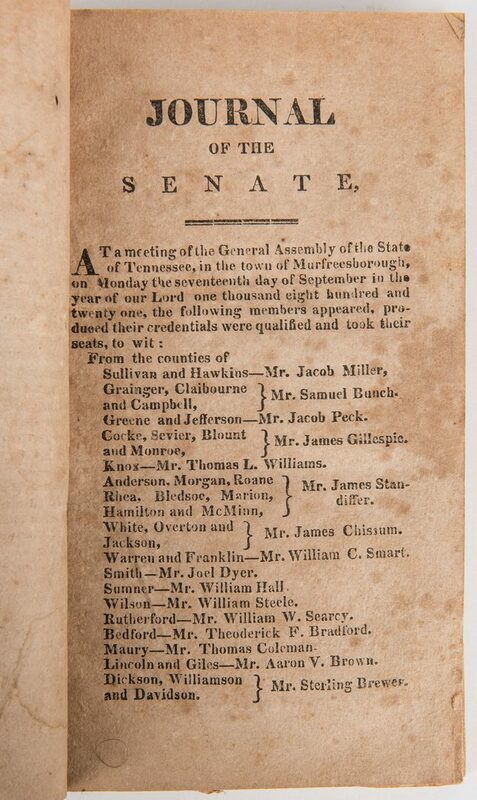 Printed at the Republican Office, Nashville. 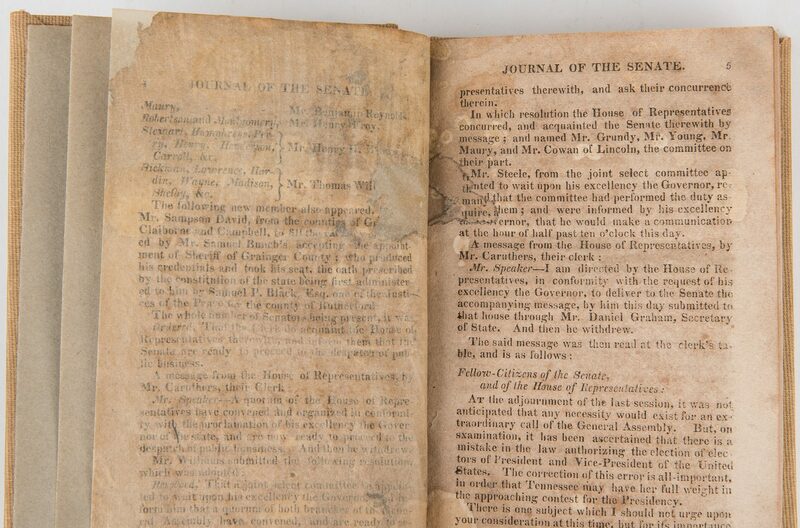 12mo, 359 pages, rebound in tan cloth, red leather label with gilt lettering to spine. 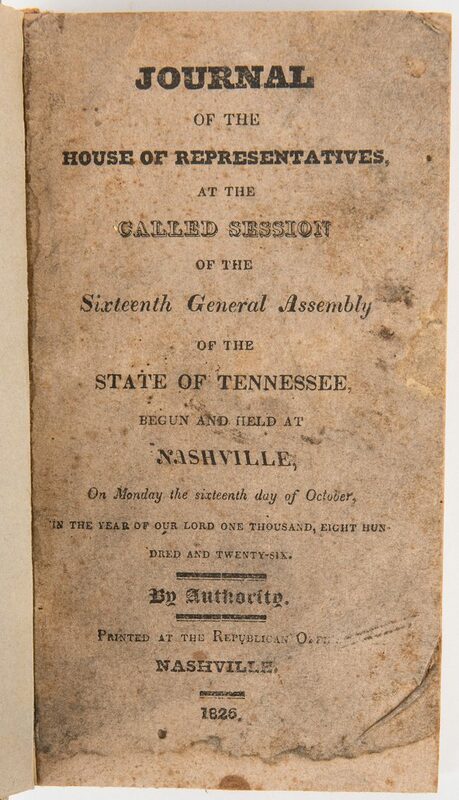 7 3/4" H x 4 1/2" W x 1 3/4" D. 5th item: Journal of the Senate, of the State of Tennessee, at the Eighteenth General Assembly, Held at Nashville, 1829. 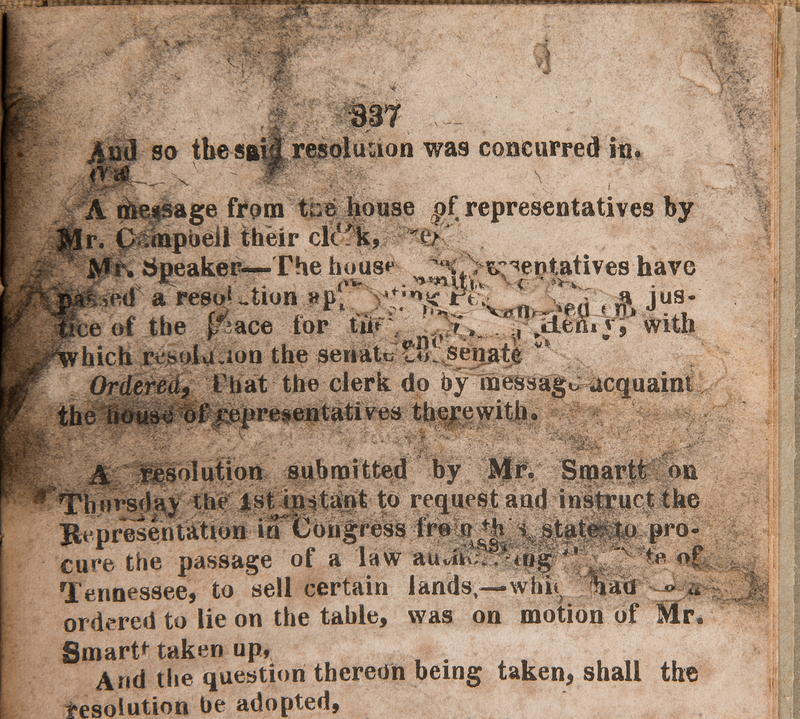 Printed by F.S. Heiskall and A.A. Hall, Knoxville. 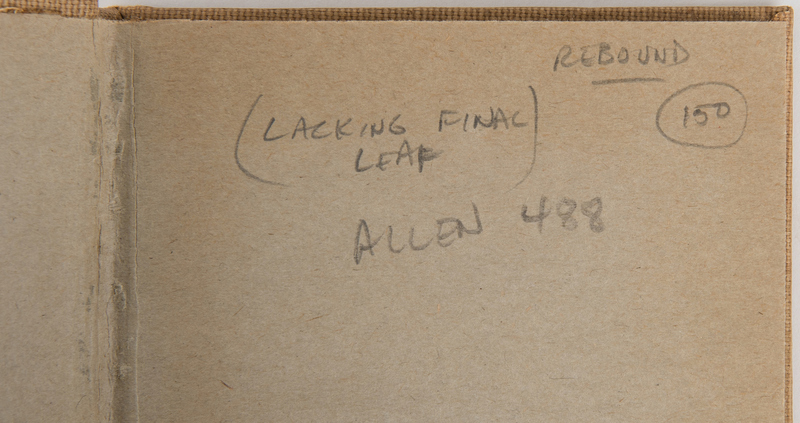 12mo, 692 pages, rebound in tan cloth, red leather label with gilt lettering to spine. 7 3/4" H x 4 1/2" W x 2" D. All items early 19th century. CONDITION: Covers in overall good condition, corners bumped. Pages with tears, insect damage, foxing spots, toning, dampstaining, etc. to be expected from age. Pencil inscriptions, top of front end paper. 1st item: Does not include final leaf. 2nd item: Does not include final two leaves. 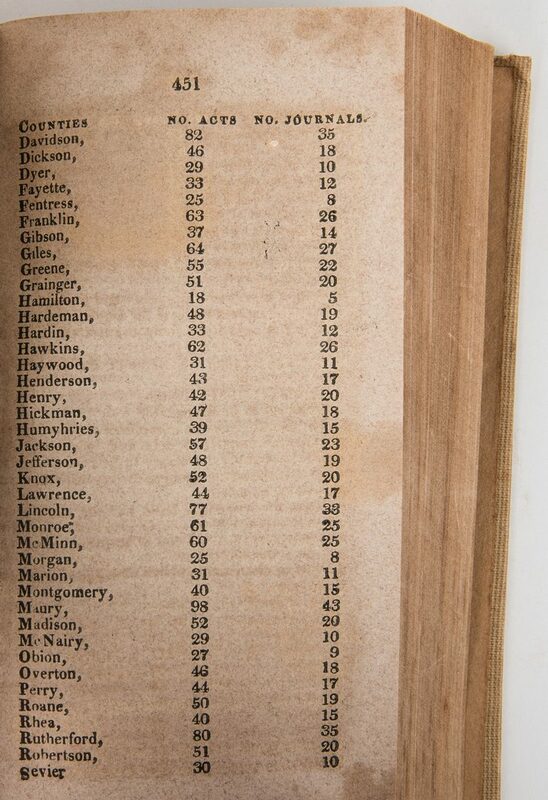 3rd item: Does not include title page.